Father was a band director at Sam Houston State University in Huntsville, TX. He became the Texas Legendary Bandmaster in 2014. Mother was a private secretary for NASA & a homemaker in Huntsville. 1966---Patty graduated from Huntsville High School. 1970--- earned Bachelor of Music Education Degree from Sam Houston State University, Huntsville, TX. 1971--- earned Master of Arts Degree, in flute performance from SHSU. Played in Campanile Orchestra in Houston, TX. 1971-1974-- taught band, Aldine, TX. 1974---won at Fulbright- Hayes Government Grant to study flute in Paris, France. 1974-1978- studied in Paris, France at the Conservatory of Music with Jean Pierre Rampal and Alain Marion, flutists. 1978-1980-- taught flute at Sam Houston State University, Huntsville, Tx and San Jacinto College, Pasadena, TX. Played in the Houston Civic Symphony, faculty Woodwind Quintet at SHSU and chamber music in Houston area. 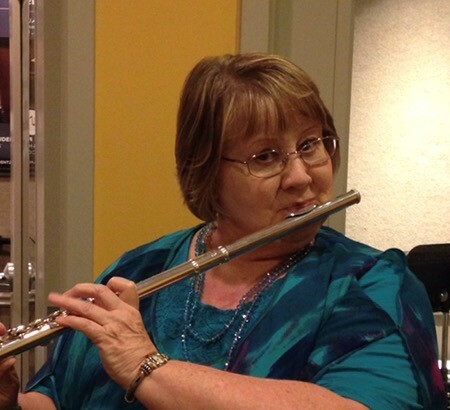 1980-1990-- taught elementary music in Texas City, TX, also taught flute privately. Played in Galveston Orchestra at this time. 1990-1995--- taught elementary music in Pasadena, TX., also taught flute privately. 1995-present---- Taught many, many students privately in the home, primarily from the Friendswood ISD. Many All State students here, earning scholarships all over the United States. The most notable being at Harvard & Brown.